In its reflections on the great paradox of rationalization or the correlations between instrumentalist reasoning, western imperialist expansion, and the humiliation of servitude under a capitalist regime, 1968 was an important turning point for critical theory. 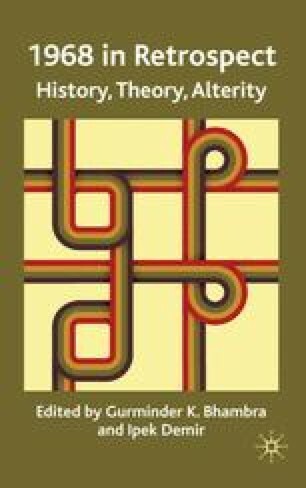 Not only did the events of 1968 revive interest in the Hegelian-Marxist, Weberian, and Freudian traditions of thought, they also compelled critical theory to revisit certain philosophical accounts of modernity’s capacities for insurrection. Prior to this period, critical theory had all but resigned itself to the belief that the objectified world would never be fully negated by a critical praxis. As the twentieth century progressed and the rebel component of the working classes seemed to disband, critical theory increasingly felt compelled to convert its normative critique of society into one of ‘transcendence’. This conscious shift from the ‘real’ to the ‘ideal’ basis of critique was necessitated by the perceived ‘fallen nature of modern man’ (Adorno and Horkheimer 1972: xiv) whose gradual descent into silence had precipitated a premature ‘end of reason’ (Horkheimer 1982) and seemed to confirm the absence of any societal crisis that could have a revolutionary outcome.